At CableWholesale we sell tens of thousands of feet of network cable daily, it is one of our bread and butter products. Surprisingly, some time has past since a technical article was devoted to this core function of ours—helping customers install and modify local area networks. With this in mind, this month's technical article explores the peripheral devices which hold networks together including: keystones, wall plates, patch panels, punch down blocks and punch down tools. This piece provides an overview of each of the aforementioned rather than a "how to" which we will delve into in the near future. Keystone modules, also called inserts, are rectangular-faced, 14.5 mm x 16.0 mm packages for low-voltage electrical, telecommunication, audio, video and optical connections. These plastic, standardized packages snap into wall plates, patch panels and surface-mount boxes via a flexible tab along their upper surface making for a fast and easy installation. 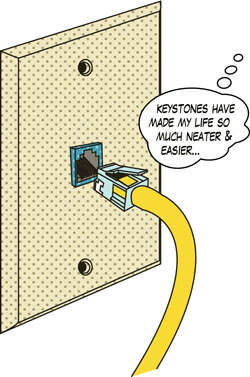 There are two basic varieties of keystone connections. The first employs duplicate female jacks on its front and back to serve as a mounted, pass-through coupler. The second type uses a female jack on its face connected to hard-wired insulation-displacement, crimp or solder connection for use with wall-installed bulk cable runs. Because keystones are replaceable, interchangeable and relatively inexpensive, they are ideal for custom installations that might require future modification. In fact, the list of available keystone type inserts is rather extensive and includes a variety of fiber optic, audio, video and A/V options as seen in the table below. Keystone wall plates are designed for mounting keystone inserts within single and dual-gang junction boxes. Found in offices and industrial buildings with extensive computer and telecommunications networks, these devices provide a clean, custom look to installations. In fact, it is becoming more and more common for newer built homes, especially lofts, to feature wall plates with Cat 5e/6, phone and even A/V keystones. Wall plates are available in a range of colors although white and beige are the most common. Furthermore, they are made to support 1, 2, 3, 4, 6 and 12-keystone ports. These products are used to organize and connect lines of structured cabling systems in offices or industrial settings. Patch panels feature between 12 and 96 ports with each port/jack mapped to a specific telecommunications line. 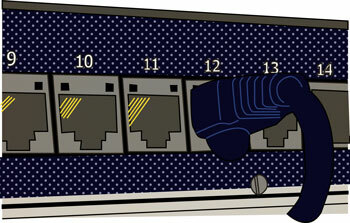 Standard communications patch panels are made with RJ11/RJ12 ports. 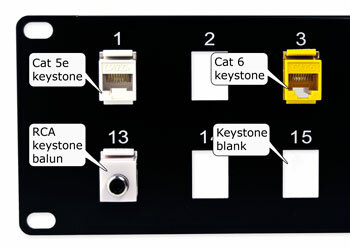 Network variations are offered in both Cat 5e and Cat 6, with each having the female RJ-45 jacks on the panel's face and IDC connections (110 or Krone) on the rear. Patch panels are made in 10, 19 and 23-inch widths with the 19-inch variant being the most common. These panels are designed to screw into standard 19-inch rack spaces. This method is commonplace for patch panel installation in offices with dedicated server rooms. Small-scale users without the need or space for a complete rack system can utilize dedicated wall mounts to attach a patch panel directly to a wall. For convenience many direct mounts feature a hinge on one side for easy access to the panel's rear wiring without removing the whole system from the wall. Often standard patch panels do not provide the necessary options with only telecommunications or network-type ports. Users with custom needs should use blank, keystone module, patch panels instead. These modular panels are constructed of a thick, solid steel sheet with numbered port markings along their front. 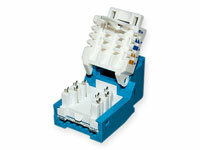 Each panel offers from 16 to 48-blank ports that are designed to each hold one keystone insert. Keystones can be mixed and matched to generate nearly any configuration from fiber optics to BNC connectors to Cat-type and everything in-between. Modular patch panels provide smaller users with only the options they need with the possibility for future upgrades compared to fixed-type patch panels. Just as the case with traditional patch panels, these blank-type can be mounted to both rack systems and hinged-type, wall panel mounts. Punch down blocks, the precursors to telecommunications patch panels, are devices used to maintain multiple electrical connections for use in telephony. They all allow fast and reliable connections of small gauge, solid-core wire through the use of insulation displacement connectors. Punch down blocks come in various sizes as well as different varieties of IDCs such as 66, 110 and Krone types. While their usage has waned since the explosion of the Internet and its plethora of associated Cat-type network connections, they are still common in older buildings and dwellings. Punch down tools are screwdriver-like, hand tools used by technicians for installing network and telecommunications wiring. These tools allow fast connections and terminations of solid-core wiring runs and jumpers in patch panels, punch down blocks and keystones. Quality punch down tools are impact-type which feature an internal spring mechanism to help deliver a consistent force blow to seat a wire in a terminal. 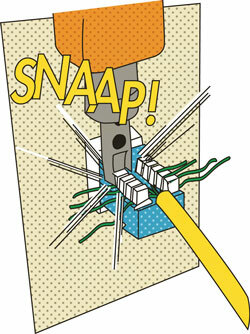 Impact-type punch down tools require some pressure from the user before they make the connection with a "snap" sound. Any installer will attest to the usefulness of these tools as they save one&apos;s hands from blisters on medium to large jobs compared to their cheaper non-impact counterparts. 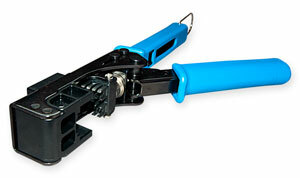 Impact-type punch down tools are available with interchangeable blades for 66, 110, Krone and universal IDC blocks. Additionally, blades are available that simultaneously strip, connect and terminate end connections when not using a jumper. 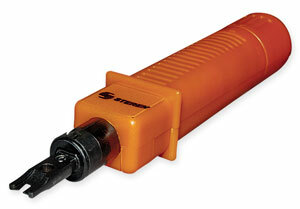 Another tool of note for network installers is the newer EZ-RJ45 crimp tool. This unique tool will accept an entire RJ45 keystone and terminate the entire keystone with one motion along with trimming all eight wires. This tool works with both Cat 5e and Cat 6 keystones and represents a significant time savings over traditional punch down tools on longer jobs. Q: What is the difference between 110 and 66 type connections? A: 66 blocks were used for most telephone connections in the United States until about ten years ago when they were supplanted by 110 blocks. 110 blocks are smaller and provide a broader frequency bandwidth (100 MHz versus 16 MHz) than 66 blocks. Q: What does RJ (as in RJ12 or RJ45) denote? A: RJ is an acronym for Registered Jack. This name refers to the female jack connector and its associated wiring scheme. However, this strict terminology is rarely used and instead most often refers to both the male and female modular connectors. Q: What are the main differences between Cat 5e and Cat 6? A: The main difference between these cable types is their maximum available bandwidth. Cat 5e is rated for up to 100 MHz while Cat 6 is rated up to 250 MHz. Cat 6 achieves its higher performance over Cat 5e by more twists per inch, a spline plastic separator and larger diameter wire gauge among other things. Q: What is the difference between T568A and T568B wiring standards? A: Both wiring schemes are permitted under TIA/EIA-568-A wiring standards. The difference between these two is that the orange and green wire pairs (pairs two and three) are interchanged. 66 block (a.k.a., M-block): A type of punch down block used to connect sets of 22-26 AWG solid-core wires in a telephone system. 110 block: A type of punch down block used to connect sets of wires in a structured cabling system. 110 is also used to describe a type of Insulation-displacement connector used to terminate twisted pair cables which punch-down tools. Insulation displacement contact (IDC): Contacts found in ports which are designed to be connected to the conductor of an insulated wire by a connection process which forces a blade or blades through the insulation, removing the need to strip the wire before connecting. Krone block (LSA-PLUS): An insulation-displacement connector for telecommunications. It is a proprietary European alternative to 110. Local area network (LAN): A high-speed computer network that connects computers and devices in a limited geographical area such as home, school or office building. Port: A specialized outlet on a piece of equipment to which a plug or cable connects. 19-inch rack: A standardized frame or enclosure for mounting multiple equipment modules. Each module has a front panel that is 19 inches wide, including edges or ears that protrude on each side which allow the module to be fastened to the rack frame with screws. Solid-core wire: A wire composed of one piece of metal as opposed to its stranded counterpart. Stranded-core wire: A wire composed of a bundle of small-gauge wires to make a larger conductor. Structured cabling: A building telecommunications cabling infrastructure consisting of a number of standardized smaller element subsystems.